Age Requirement: Ages 6 and over. Ages 6-17 MUST be accompanied by an adult. Out of all the former Beatles, Paul McCartney by far had the most successful solo career, maintaining a constant presence in the British and American charts during the '70s and '80s. In America alone, he had nine number one singles and seven number one albums during the first 12 years of his solo career. Little more than a year after the Beatles' breakup, McCartney had formed Wings with his wife, Linda, and the group remained active for the next ten years, racking up a string of hit albums, singles, and tours in the meantime. By the late '70s, many critics were taking potshots at McCartney's effortlessly melodic songcraft, but that didn't stop the public from buying his records. His sales didn't slow considerably until the late '80s, and he retaliated with his first full-scale tour since the '70s, which was a considerable success. 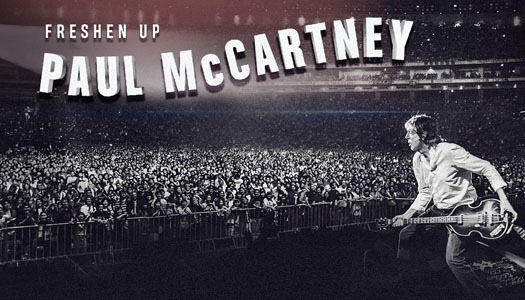 During the '90s, McCartney recorded less frequently, concentrating on projects like his first classical recording and the Beatles' Anthology project.